Blue Ruin writer/director Jeremy Saulnier continues his strong streak of darkly mature thrillers in his third feature, Green Room. The story of a punk rock band getting entangled with a group of Oregon neo-Nazis after a show becomes a tense, violent exploration of escalation. Saulnier slowly frames the film as a rich portrait of desperate but intelligent people struggling to escape their situation. Saulnier shows an incredibly assured hand as a filmmaker with a patient but confident lens constructing the story through a bunch of punk kids just minding their own business. Even his depiction of backwater Neo-Nazi skinheads in the Pacific Northwest feels painfully thought out. It's a dirty, nasty film in many moments but is also undeniably stylish as it explores the limitations of human survival. Patrick Stewart gives a firm but understated performance as the cool-handed leader of skinheads and true believers trying calmly to dispose of a bad situation without anymore trouble or police involvement as the band, the Ain't Rights, witnesses a troubling crime scene backstage. Anton Yelchin leads the film as the scared frontman of the band desperately trying to escape at any cost. A quiet Imogen Poots doesn't show much but her character is wisely revealed more as the action builds. She's made more fascinating by virtue of her lack of introduction or clear motivation in contrast to the others. Alia Shawkat lights up the screen as a familiar face and distressed band member alongside Joe Cole and Callum Turner. Blue Ruin star Macon Blair is another standout with a low-key but still vibrant performance anchoring the insane violence and escalating terror as a loyal but troubled skinhead follower. Mark Webber has a small but significant role as a rogue member also with mixed motivations. 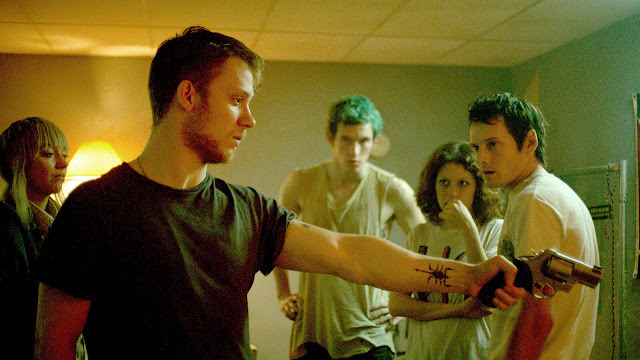 It's a quiet cast of solid hitters who make Green Room such a thoughtful thriller of character and action. It's a disturbing, realistic feeling endeavour about punk kids and dangerous men. The film is made further refreshing but how little ideology or real plot is involved as the film is structured entirely around situational actions. Saulnier has created the ultimate nightmare for any desperate person looking to get out of a bad situation quickly getting worse. Green Room screened at the 2015 Vancouver International Film Festival.